www.TrilliumMedicalCenter.com is a US based medical facility in south Florida, which specializes in Internal medicine .The centre has facilities to treat Internal Medical problems. 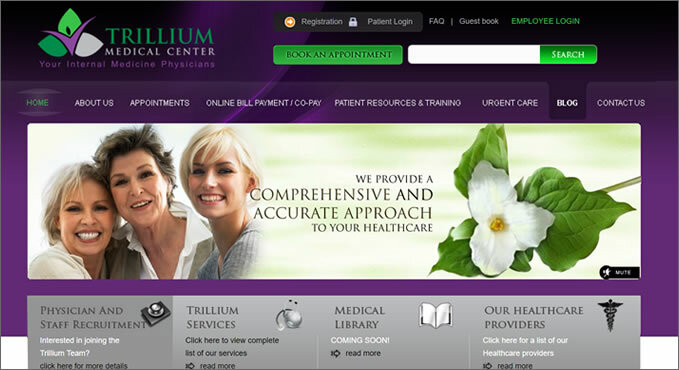 Trillium Medical centre web site provides Effective patient appointment system for registered users. Customized administrator control mechanism to cancel or fix the appointment is in place, with options for patients to view the status of appointments. Effective user Engagement is through polls, Blogs and Newsletter, which provides recent updates to patients. Social media integration (Face book, Twitter, RSS feeds), which is a must for every web site is done. Secured payment integration with trusted gateway providers to ensure the safety of patients is provided. The site is developed using PHP 5.2.14, MYSQL 5.1.45 and hosted on Linux server. Glamorous Fashions is an online retailer based in Canada offering customers a premium shopping experience, with the option to purchase or lease authentic designer goods and accessories. The company also sells beauty products. Registered users can buy or rent the product with flexible return options, based on membership choices. They can opt to keep a leased item for a longer time or buy it. Payment gateway integration with PayPal ensures the security of customers. Shipping provider integration is provided with Canada Post, enabling ease of shipping or returns within Canada. 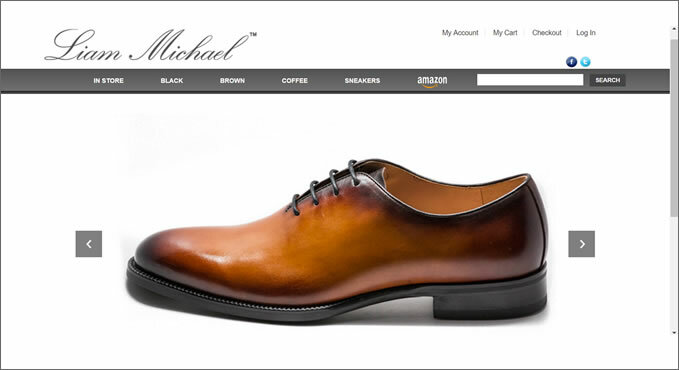 Customers can shop 24x7x365 by collection, designer, style, color, or by product type. 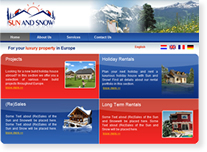 The Sun & Snow website is developed for rental of holiday properties. The site has four language options. They are English, Netherlands, French and Dutch. There are 5 main sections to display the projects, Resale, Rental, Long Term rental and Last minute deals. Rentals, Long Term rentals, and Resale can be searched with geographical options. There is Online Reservation (Mailing form) and Newsletter subscription. The project is developed using ASP.Net 2.0 and MS SQL server database. 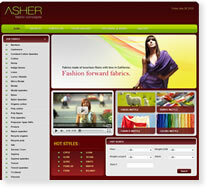 Asher Fabrics is a fabric display site for 32 types of fabric which are listed on the site in an aesthetic manner. The Home Page features fibers, colors, prints and fabrics currently in style, with fashion models on video presenting fabrics in vogue. A search option is provided to find fabric styles by fiber, stitch, weight, etc. Current styles and trends are displayed under Hot Styles @ Asher. The Color Forecast predicts the colors that would be popular in the up-coming seasons. Users can request for swatch samples using a form. The admin panel is used to manage fabrics, styles, stitches, featured hot styles and colors. The home page has a short flash intro. 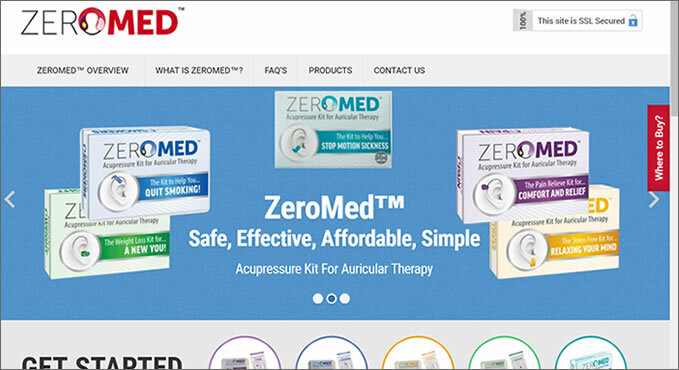 This custom-designed dynamic site is developed in PHP and uses MySQL database. 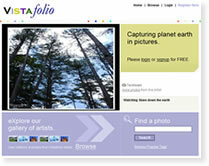 www.vistafolio.com captures planet earth in pictures. This website is for users to post scenic photos of specific places. The website is developed in ASP.NET 2.0 with MSSQL Server 2005 Database. Web 2.0 and Ajax are used selectively. There are features for Members Registration / Login, Option to View / Edit profile, Upload Photos based on the category, View / Edit / Delete Photos and rate and comment on photos. The users can search any photos uploaded by artist using the Caption, Tags. The search function matches caption & tag and display the results. There is a secure web admin panel for Category Management, Members Management and Photo Management. In order to rate / comment the users need to login / register. When a user registers, they need to identify whether they are going to upload photos and be an Artist or just view and be a Visitor. Artists can "label" their Portfolio. Users can search by Artist, Portfolio, and Tags. There is a tag Management in the web Admin panel. Two tags can be merged. Artist can send an invitation to someone to view his or her photos and portfolios. Artist can store email addresses and names for each Guest and send mails. The Artists can create many Portfolios. The Artist can link a Photo to any number of Portfolios. While a visitor searches for a photo, there is an option to view all the photos of an artist. 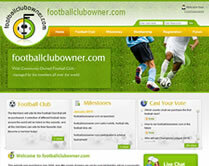 Footballclubowner.com is a virtual football club in cyber space. Though the club is virtual, it will manage a real football team with the help of decisions made by its members on the website. Football fans across the world can join this club for a nominal yearly membership fee and become one of the club owners who collectively make decisions regarding the functioning of the club. Each member will have his own profile and avatar. Members can create their photo albums. They can also make friends on the club. The website provides excellent communication features for its club members. They can converse in a public chat room or invite other members or friends for private chat. The website facilitates a discussion forum where the club members can discuss on various topics related to to the club and football. Decisions such as which team to buy, the color of the team's sportswear and so on, are made by the club members. Members cast their votes on polls posted by the webmaster. All in all, this virtual club promises a great experience for football fans all over the world. 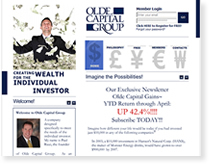 This site was developed for Olde Capital Group, LLC for marketing their newsletters discussing financial markets and investments. The newsletter is primarily marketed over the Internet. The Clients have the ability to browse free articles, print them, subscribe to newsletter, or if an existing client, sign in to view/print the newsletters they have subscribed to. Payments for the newsletter subscriptions is made on line through PayPal. All Subscriptions to the publications are offered with a 7-day trial period. Clients have a choice of one year subscription or two year subscription with a discount. There is also an option available to cancel a subscription online and obtain a refund for the unused portion of subscription. The database used is MSSQL Server 2005. The scripting is done in ASP.Net 2.0, Flash actionscript and XML. 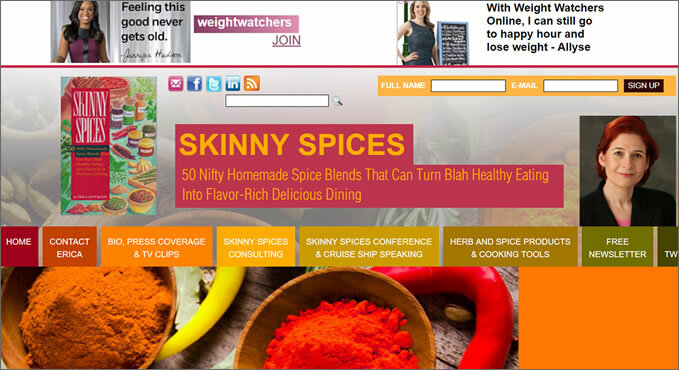 A Flash website Template is used to customize the front end design. There is a secure web admin panel using which the Olde Capital Group can manage the site fully and update contents, publications etc. Members can register to receive free publications regularly. 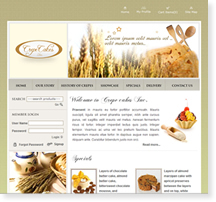 This is an ecommerce site developed to sell Crepecakes. These cakes have a French origin. They are sweet but very light and the site has been designed to convey these qualities. In the home page special products are displayed. Customers can also register with the site. The Products & Categories can be changed and displayed. 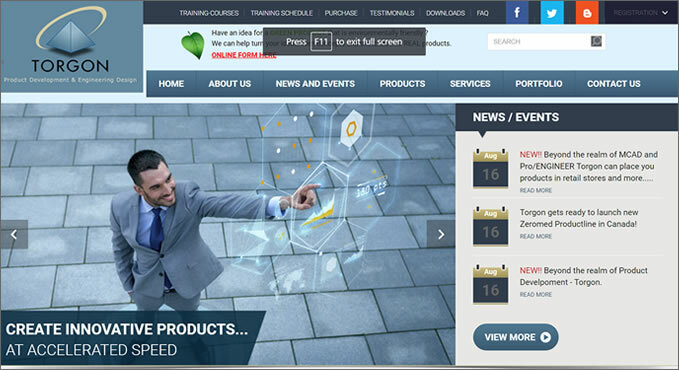 There is Product Search facility. The Shopping cart manages the items in the cart. There is a tax calculator. Order notification email is sent automatically to Web Master & customer. Google Checkout is provided with option to enter billing details, shipping details and credit card information. The site is developed in ASP.Net 2.0 and uses MSSQL server Database.